Artist Peregrine Church has created Rainworks, a project that turns Seattle’s over abundance of rain into an opportunity to enliven street life. 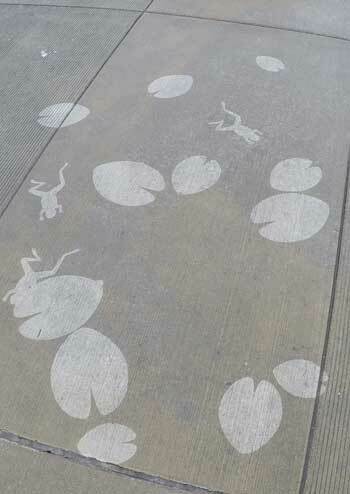 Using stencils and a non-toxic, biodegradable “superhydrophobic coating” made of nano-particles called Always Dry, Church has created a fun, do-it-yourself template, demonstrating how to use concrete pavement as a canvas for artworks, illustrations, and messages — but only when wet. 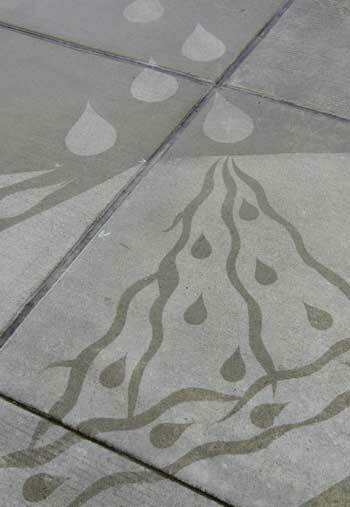 Church has created about 25-30 works of “rain-activated art,” featuring messages like “Stay Dry Out There,” a lily pond filled with frogs, a fun hopscotch game, and other natural patterns. Another D-I-Y way to improve street life and, really, a whole city’s approach to accessibility, is Walk [Your City]. This non-profit started by Matt Tomasulo, a landscape architect, enables communities to order and install their own signs explaining how far it is to walk to different locations. Cities like Santa Fe, New Mexico; West Hope, West Virginia; Atlantic Beach, North Carolina, have all used Tomasulo’s process and signs to create more walkable places. See Walk [Raleigh], which won an ASLA student award in 2012 — and really started it all. This is fabulous! How about stenciling inspirational quotes….or DINOSAUR footprints! Or fossils? As if they were hidden inside the concrete!